Would one hospital solve an acute nursing shortage in Muskoka? One has to wonder as Muskoka Algonquin Healthcare hosts recruitment fair Saturday March 24. Wasn’t it just New Year’s when they were 17 short, due to overcrowding and underfunding from the province? Shouldn’t MAHC have a long list of nurses on file they can call on? 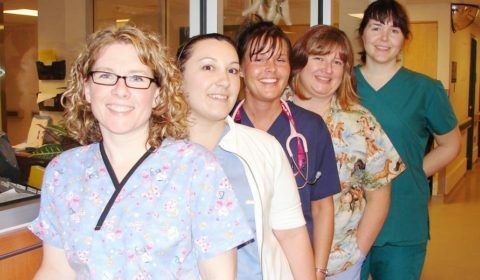 A list of ready-to-go RNs? In an emergency — like this. Would this happen if a super hospital could attract more staff than two smaller sites? MAHC looking for skilled RNs to work in emergency, surgical services, intensive care, obstetrics and medicine in both Huntsville and Bracebridge. Robert Alldred-Hughes, chief executive of human resources and support services, says MAHC recruited several qualified people in one day at its last fair in 2015. RNs should bring their up-to-date resumes and be prepared for an on-the-spot interview, he said. Full-time, part-time, and temporary positions are available. The recruitment fair is on the 24 from 10 a.m. until 2 p.m. in the boardroom at the Huntsville District Memorial Hospital. This all comes after Esther Millar was recently appointed chief nursing executive and clinical services. She says MAHC has been working for months on strategies to cope. And nurses have been doing their part, putting in overtime and dealing with extra beds unfunded by the province but paid for out of the internal hospitals budget. Again, not enough community-based services and PSWs in Muskoka are being blamed for a backlog of long-term beds crowding the hospitals, and bulging home care wait lists. At the District of Muskoka they are making noise about bringing more long-term care beds to the Muskoka. But is that the answer, when the beds could be allocated to out-of-Muskoka residents on a LHIN priority waiting list? Or will that put more pressure on a nursing pool already short?